3/8" Solid steel window curtain rodding, by Kirsch -- BasicQ Inc. Minimum 12 feet. Brass colored 12 foot solid steel rod. For extra long curtain rods. 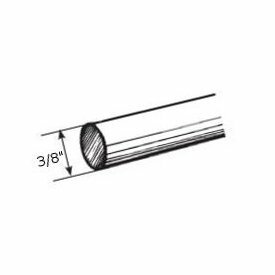 Note: Select Cut for shipping in the shipping options at checkout to avoid truck shipping cost when having rod cut to less than 105". Priced by the foot..